The thing with hope is that it exists even in the most unlikeliest of circumstances. Arsenal faced 23 goal attempts, didn’t force Manuel Neuer to make a save but were still a whisker away from winning the tie. Laurent Koscielny scored with five minutes remaining to make it 2-0 meaning Arsenal only had to score one more to go through. In the end, the siege at the Bayern Munich goal never came so perhaps hope errs on the side of reason. It was a strange game; Bayern Munich didn’t play like Bayern Munich normally do and Arsenal unlike Arsenal, and that created a dynamic far different to the first leg. 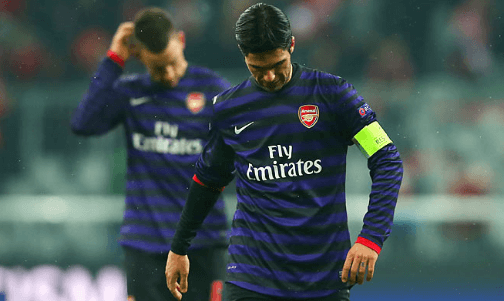 In truth, FC Bayern didn’t do much different to how they were set out at the Emirates. They created lots of chances (but missed) usually from the edge of the box and attacked primarily down the right with Philip Lahm and Thomas Müller, while at the end of the match, Arsene Wenger was still able to comment that Bayern Munich “defend very, very well.” But their mentality stank and the Allianz Arena shared that timorousness as soon as Arsenal took the early lead. Arsenal weren’t able to profit considering how well they generally tend to play when the momentum swings their way. And as such, we probably didn’t learn that much from Arsenal last night despite the resilience they showed. The flipside of a near-perfect defensive game was that it would invariably have some sort of effect on the team’s attack but Arsenal’s passing was blunted because of Bayern Munich’s exceptionally marking off the ball. It also confirmed that The Gunners still lack a player who can spot gaps in an opposition defence bar Santi Cazorla (and the speed of Theo Walcott) and he had to be shunted out wide to find creative balance. As such, the onus fell on Aaron Ramsey as the “spare” midfielder who could spring out of the defensive block and instigate forward movements. He did just that when he was involved in creating Arsenal’s opener but after the third minute, Bayern’s midfield made sure he was not to break free into space again. Arsenal should have made the switch earlier to move Cazorla centrally but it appeared as if Wenger was waiting to ride on the crest of momentum that a late goal would bring and that, hopefully, would spark the winner. Laurent Koscielny’s header on the 85th minute didn’t provoke such a reaction but Arsenal were still able to exit with their heads held high. The defence performed magnificently under the inevitable quality that FC Hollywood possess in attack while Lukasz Fabianski not only pull-off some brilliant saves, but was the vocal organiser that the back four needed to defend perform as it did. But a word on Fabiasnki’s shot-stopping: his technique is probably surer than Wojciech Szczesny’s (Wenger frequently compliments that side of his game) and as such, the fumbles and mis-parries that Szczesny’s recent displays has been littered with, were eliminated. Failure might have been herioc and glorious and some pride restored but ultimately, elimination by a “technicality” leaves many regrets, tracing back to a fortnight ago in London where not conceding was of paramount importance. But it may also go as far back to the summer where the squad was stripped of a “game changer” for the first time Arsene Wenger’s reign. Arsenal had everything else last night.